Invacare Roze Stand Assist Aid Safe And Easy To Use. 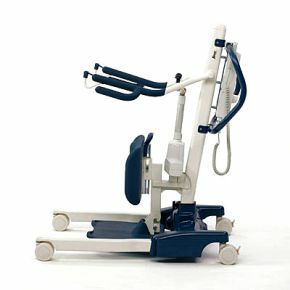 The Invacare® Roze stand assist offers an alternative to a passive lift when a degree of weight bearing ability remains. 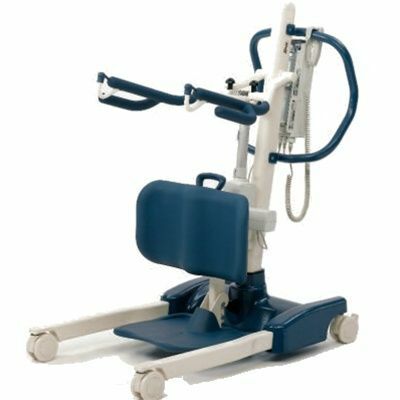 Ideal for rehabilitation, degenerative conditions and clients whose condition varies from day to day, the Roze can provide dignity and a greater degree of independence. With the latest control box technology, the Roze offers a 'Soft Start' and 'Soft Stop' function that provides a more comfortable transfer. Combining a range of adjustable features with a lightweight aluminium construction, the Roze is equally at home in Residential and Acute Care environments. The Invacare® Roze is a versatile stand assist lifter that supports the transfer of individuals who can only bear a minimal amount of their own weight. Ideal for transfers from a seated to seated or seated to standing position, the small footprint of the Roze and wide leg opening offers a flexible and comfortable transfer. The Roze is fitted with the Jumbo Care control box: an intelligent service lifetime monitoring system that highlights the battery status and service condition of the actuator to ensure safe patient handling. Height-adjustable leg support-The padded leg support can be adjusted for different user needs. Removable foot plate-The footplate is horizontal and can be removed for standing / walking a patient during rehabilitation. Jumbo Care-This intelligent monitoring system includes a service reminder, emergency operation, audio battery alarm, and battery indicator. *NOTE: Varies depending upon load and stroke.